*** Rates are NOT always accurate, due to VRBO not able to decrease rates, with more days added in your stay. Please ask. *** 201 214 1582. ASK ABOUT SAME DAY BOOKING. Fantastic View of Camelback Ski Slopes, off all 3 decks, w outside speakers on all decks! Enjoy the view of the night skiing lights from the Living Room window. Our mountain townhouse rental is situated in the Prestigious NORTHRIDGE Station development, just 2 minutes away from Camelback Ski Slopes/Camelbeach Water Park. Our 4 Bedroom/3 Bath Townhouse is clean and airy. Plus, CENTRAL AIR! Our townhouse is in the great location on Maple Court, known for it's wide street and fantastic views of the slopes! - Dog Friendly. Licensed vacation rental owner. Our townhouse gives you faster access to the parking area, coming from the opposite direction of the traffic - going down the mountain, not up the mountain. Spend less time on the long line and more time skiing/snowboard! 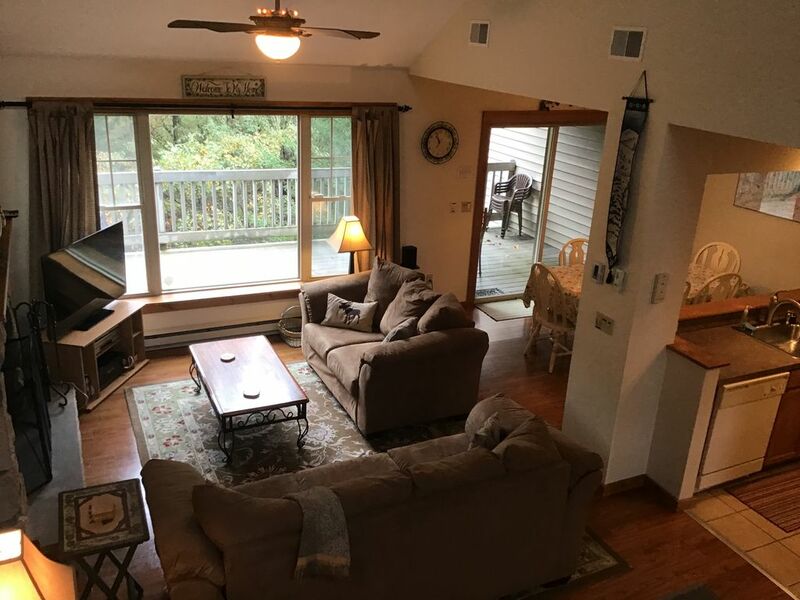 Upstairs, the Master Bedroom has a new King-Sized bed and sliding glass door leading onto a deck with two Adirondack Chairs, overlooking the mountain. Enjoy the tranquility as you sit and relax. Also, upstairs is another bedroom with twin beds and a bathroom. On the main floor, the Family Room has all new furniture, with a Full Sized sofa bed (extra plush) and a wood burning fireplace! Along with a SmartTV, you have a Digital DVR where you can record your shows, rewind and pause live TV! There are speakers inside and out for the stereo, IPOD ready. A sliding glass door off the dining room goes onto the over-sized deck, with 6 chairs, a large table and a Weber large BBQ GAS GRILL. Also, on the main floor is the 3rd Bedroom with a Queen sized bed, Dining Room, Kitchen and Full Bathroom. Kitchen is fully stocked, with a PANTRY for storage. Outside storage closet for all equipment! You will receive a STARTER kit of paper towel, toilet paper, dishwashing detergent, dishwashing liquid and soap. In the summer, you have the scenic view of the valley, in the front and the private decks in the back. You cannot help but relax and take in the mountain air with the beautiful scenery! Our community has an outdoor heated full length swimming pool (open Memorial Day to Labor Day), plus kiddie pool, and tennis courts just a minute drive. Pool fees not included! Up to only 8 people allowed, not included 5 year old and under. Fitness room, with nominal fee. * THREE FULL BATHROOMS! Can't beat that, when you have a large group! * All 3 decks overlooking the beautiful slopes! * 5 TV’s with DVD players and some VCR players - LR has DVR! * Digital Cable TV & DVR (rewind, pause and fast forward live TV!) - perfect to record your shows while you are out! An added bonus! * Fully finished and furnished basement - with Queen sleeper and 2 loveseats in Living Area. Plus 4th bedroom. Contact Claudia 201.214.1582. "Claudia's Vacation Rentals"
We have bought this townhouse as a second home. We enjoyed our family time here and now are ready to share it with others. We hope you enjoy our townhouse as much as we enjoy it. We try to have as many things as possible, for our renters. As we feel our dog is part of the family and take her wherever we can take her, we are allowing DOGS ONLY. Bring her/him along! Unfortunately, we do not allow CATS, as many guests are allergic to them. We would like all of our guests to enjoy their stay without sneezing and having problems breathing. NO CATS, sorry. Contact Claudia 201.750.1215. "Claudia's Vacation Rentals"
We loved the way the streets and houses look. We love the wide street on Maple Court. We wanted to be right there where the slopes are. While hubby and the kids want to ski, I can just take 2 minutes to drop them off at the ticket booth and come right back. All 3 bathrooms are full baths. One on EACH 3 floors. Spectacular Winter View of Camelback Ski Resort Slopes! Night Skiing Makes the Mountain Look Like a Giant Christmas Tree! Wood Burning Fireplace. No firewood provided. 2 spots only, outside the townhouse. Other cars in overflow parking area. $6/daily, paid directly to development. Everything You Could Possibly Want. Fully Stocked. Helmet NOT included. Please bring your own. Fitness Center - $6/day per person - arrange with the management office by the pool. Pool Fee - paid to me and I pay the Management Office; Up to only 8 people allowed, 5 years old and under do not count in 8 count. No Exceptions! We had a great weekend here. The house was plenty big enough to fit two families with 7 kids. It was a short (3 minite) drive over to Camelback for skiing. Everything was clean and well-functioning. And the owner was very responsive, both to our last minute request to stay here and a couple questions during the stay. All in all, this is a great spot, and we look forward to going back. Townhouse is beautiful and spacious. It's bigger than the pictures show. It is very clean and we felt right at home. The owner is great to deal with and the whole experience was fantastic. It is perfectly located between Camelback and all of the other attractions in the area. I would definitely recommend! Thank you Michael. So happy you enjoyed your stay! The owner was so responsive and went above and beyond when needed. The complex is pretty strict which I felt at first was a downside. After staying though, I felt very safe knowing that we were being looked after, especially since the nearby condos were empty during our stay. The location is both remote and populated with a little town close by and the views from the multiple decks were fantastic. That night time view of the slopes really made our ski weekend feel like a getaway! The kitchen was well appointed with plenty of dishes, silverware, pots & pans, coffee pot, etc. My family and I rented this townhouse for a short stay. We went to Aquatopia Water Park in Camelback which was 5 minutes away. The owner, Claudia, was fantastic. Any questions we had were answered immediately. We have rented homes in this area before and most owners do not answer questions or concerns right away. The house was beautiful and well maintained. I would definitely recommend this house to all my family and friends and would rent this home again. Thank you again Claudia. We had a wonderful time! It was our pleasure. We always gladly welcome our guests that appreciate our work and time. Enjoy the upcoming holidays! We had a great time. With 4 adults and 5 kids there were plenty of options to accommodate us all! Very close to lots of attractions. Perfect for a ski weekend, but might make another visit in the summer. The owner was very responsive and helpful. Thank you!! Beautiful Home for a Weekend Getaway with Family!!! I just want to say that we stayed at Claudia's home and it was absolutely beautiful. There were 12 of us including children and the home was so spacious, warm and inviting. It had all the amenities plus more. We had a direct view of Camelback mountain. Everything we needed was just a short drive away. We will definately be taking this trip yearly and booking this home. It was all it was described to be and more. Thank you for lending us your home Claudia. Park - 5 minute drive. There are basketball courts, baseball field, junglegyms, pavilions with BBQ grills, bathrooms. Excellent chance to have a picnic and have the kids run around and play! *** Rates are not accurate, due to VRBO not able to decrease rates, with more days added in your stay. Please ask. *** Sec Dep Req - $500 HOLD/RELEASE * Holidays extra If the possibility of a cancellation concerns you, please look into Trip Cancellation Insurance.